The School Council meets weekly to discuss ideas and issues on a given agenda. We also look for our School Council to get together with other School Councils to share and discuss ideas. The meetings are supported regularly by members of the school Senior Management Team. Each year the School Council writes its own action plan and is given money from the schools budget for improvement. Children have a say in many matters and vote to decide the end of term reward for children with 100% attendance and the class with the highest attendance. The children have been involved in giving their thoughts to the learning environment and have also decided Our Play Ground Rules and used their money to purchase a sign displaying these. Each year the council is invited to take part in The Local Democracy (Mandate for change) at the local town hall, where they discuss with other local schools. They also visit the Houses of Parliament on an annual basis where they get a real understanding of British Values and how decisions for the country are made. The importance of laws, whether they are those that govern the class, the school, or the country, is consistently reinforced at St. Mary’s Catholic Academy. Pupils are taught from an early age the rules of the academy. These are our School Rules. Pupils are taught the value and reasons behind rules and laws, that they govern and protect us, the responsibilities that this involves and the consequences when laws are broken. Visits from authorities such as the Police and Fire Service help reinforce this message. ‘Rules’, ‘Right are Wrong’ and ‘Laws’ are taught and embedded as part of the academy’s PSHCE scheme of work which is delivered throughout the whole academy. At St. Mary’s Catholic Academy, pupils are actively encouraged to make choices, knowing that they are in a safe and supportive environment. As an academy we educate and provide boundaries for young pupils to make informed choices, through a safe environment and an empowering education. Pupils are given the freedom to make choices, for example, whether it is through choice of challenge, or simply by choosing to participate in our numerous extra-curricular clubs and opportunities. Our creative homework projects allow children to partake in activities that interest them and present them in interesting ways. 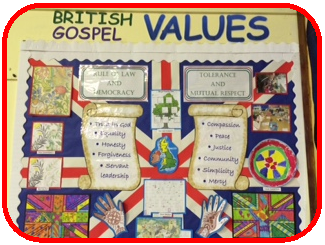 Part of our academy ethos and behaviour policy has revolved around Core Values such as 'Respect', and pupils have been part of discussions and assemblies related to what this means and how it is shown. The school ethos and aims promote respect for others and this is reiterated through our classroom and School Rules, as well as our behaviour policy. Bullying has been an area whereby the academy has placed a strong focus and provided children with a variety of assemblies and workshops to help them to reflect upon and understand the impact of bullying others. Each year the school council introduces bullying week with an assembly prepared by themselves. St. Mary’s is a Catholic Academy. We are proud of our Religion and its teachings. Jesus taught us to “Love one another as I have loved you.” Due to this we have respect for all regardless, religion or background. All our Religious Education lessons and PSHE lessons reinforce messages of respect for others. Members of different faiths and religions are encouraged to share their knowledge to enhance learning within classes and the school.